The all new Ocean King 2 / Tempak Ikan – Monster’s Revenge , available at club suncity, is an 8 player fish hunter style arcade game, which has already become a roaring success among gamers who were impressed with the performance of the previous game, Ocean King. The main component of this game is a 55 inch LCD screen that supports 3D HD gaming graphics, which gives a new feel and color to the game’s characters and levels with an added flavor of vibrancy and detail. The game is extremely interesting and action packed, and is equally enjoyable for the people standing by as well as the people who are playing the game. Each new level brings in new challenges, which make the game interesting on almost every level. The second version of Ocean King has maintained all the features of the original game, which include Overlord Whale, Chain Lightning, etc, and numerous returning characters from the original game, which amount to about 16 characters. There are some new mini games, characters and features as well, that have been added to Ocean King 2, so that players get the complete package. 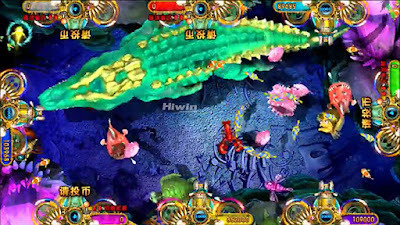 With similar game controls and transitional effects, people who played Ocean King would find it extremely natural to play the sequel version as well. The returning characters in Ocean King 2, available at club suncity, which players will simply love, include Snapper, Flounder, Fogu, Devilfish, Lion Fish, Clown Fish, Lantern Fish, Butterfly fish, Saw Shark, Octopus, Lobster, Shark, Sea Turtle, Overlord Humpback whale, Bomb Crab and Killer Whale. Along with these returning characters, players can also choose to play with the newly introduced characters, such as Electromagnetic Cannon Crab, Giant Fish and Fire Dragon. Drill Cannon – The canon ricochets all around the gaming screen, causing damage to everything before it, and then stops moving to explode. Flamestrike De-Buff – This weapon appears randomly, and comes with a time limit, within which, the player has to use it to get an extended shooting time or double score for catching or killing a fish. Chain Explosion Crab – This is a revised version of the old Bomb Crab, with 3 times the explosion and equally higher speeds. With a maximum limit of x10 credits, this weapon can take down all the fish in its vicinity. Ocean King 2 offers a wonderful new mini game also, which is known as Battle in the Golden City. Players can play this mini game without any extra cost, where they must, within a specified time span, catch the fish, which would be followed by unlimited scoring options, wonderful rewards, etc., which can be used in the main game. The game has many adjustable features, which can be adjusted by the operator, which can be used to make Ocean King 2 more suited to the location it is in, such as sound effects, shooting time limits, payout feature, background music, odd, chance levels, etc. With the first game being so popular in arcades and casinos all around the world, people have high hopes from the all new Ocean King 2, as it attracts in players everyday with better payouts, better weapons, and better fish.